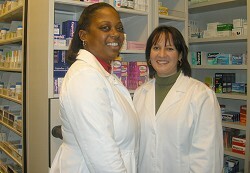 FRIDAY, JAN. 27: A new pharmacy has opened its doors at Lindo’s in Warwick. The pharmacy, located on the right as you enter the supermarket, is part of a major revamp of the store that began just after Cup Match in 2010 and has seen new lighting and refrigerated units installed throughout the building. Although the new unit may appear small from the outside a series of rolling shelves mean that it’s capacity and storage space is no different to many of the island’s other pharmaceutical stores. 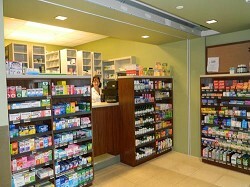 Lindo’s boss Zach Moniz said the pharmacy was the ‘icing on the cake’ of the renovation project to improve the store. He said: “For a long time our customers have been asking for a pharmacy and we are pleased we can now offer that service in Warwick as well as Devonshire. “It is a great addition to the service we can offer our customers and it means they can do all their shopping under one roof. “We have been involved in a long process of improving all aspects of the store and the pharmacy is really the icing on the cake. “I think customers will really notice the difference when they come into the store. The new Lindo’s pharmacy will be open whenever the supermarket itself is open. The opening hours of the store are 8am to 7pm on Monday, Tuesday and Thursday, and 8am to 8pm Wednesday, Friday and Saturday. For more information, visit www.lindos.bm.